Additions and changes to the main website will go here. Irishpapermoney.com was originally created in the long ago era of 800x600 monitors, and the 56k Modem being the fastest connection domestically available. Those of us who remember the bad old days of the web when your over-priced dial up would drop its connection when your upload/download was at 98% (necessitating reconnection and starting again) well appreciate the current joys of even a slow broadband connection. The web site was optimised for these modems. In the current era of faster connections, irishpapermoney.com deserves an upgrade to take advantage of this increased speed. Page sizes will also be increased. The website is modular in its construction, allowing for sections to be added and removed without disrupting the smooth functioning of the rest of the site. Thus, irishpapermoney.com is about to undergo a service Life Extension upgrade to add new content and modernise the overall structure, bringing the site to Version 2.0.0 overall. The appearance of irishpapermoney.com will not be significantly affected, though it will be slightly slower to load after the addition of all the new stuff—the slowdown will hopefully only be noticeable to those of us with 56k dial ups. Visitors who would like to suggest enhancements or adjustments, now's your chance! Main structural revamp. All pages will be increased in size from 580px wide to 960px wide. One layer will be removed, with text content merged with pictorial content and links on introduction pages. Back end changes to support this. New sections will be added to the Old Notes area. Navigation system will be adjusted to suit new structure. Many new images will be added and existing images will be upgraded from .gif to .jpg. Lightweight .gif were used to speed up loading on 38k and 64k modems. Even slow smartphones are faster than these were, so gif images are essentially obsolete in this usage. Phase One initial will go live, with various pages being upgraded on a peicemeal basis as they are ready. These upgraded sections will be listed here as they are uploaded. Phase One final will go live with the bulk of pages being changed in one upgrade. New sections will be added to the Old Notes section in this upgrade, adding the remaining banks. Main back end structural revamp. Mostly links being added, and an upgrade of the main links page to make it more relevant. • Addition of google search boxes — completed 02.09.15. • Addition of a broad range of Irish notes for sale — cancelled. Mail order implemented instead. 100% complete. • Completion of Main Links page upgrade — completed 26.02.16. Addition of extra images to existing web site structure. • Addition of B Series banknotes View By Date section — 100% — completed 30.04.16. • Addition of C Series banknotes View By Date section — 100% — completed 02.05.16. • Addition of a large number of new images, mostly to the Old Notes section, and a restructuring of this section. Images scavenged from the web over the years. Many of these were simply not available 5 years ago, when work was last done on the old Notes section. Phase Three B will happen gradually. —Bank of Ireland sections on 1918-1921 notes upgrade. Start: 18.12.16. 100% completed 28.04.17. 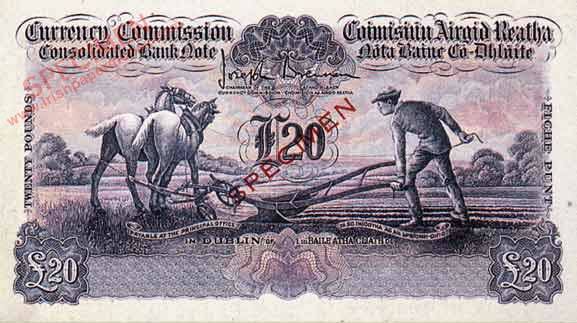 —Bank of Ireland sections on 1922-1928 notes upgrade. Start: 18.12.16. 100% completed 05.08.17. —Provincial Bank of Ireland section upgraded. Start: 01.07.17. 100% — completed 31.08.17. —Agricultural and Commercial Bank of Ireland section upgrade. Start: 01.07.17. 100% completed 03.09.17. —National Bank sections on 1918-1927 notes upgrade. Start: 01.07.17. 100% completed 04.10.17. —Ulster Bank section 1920-1928 notes upgrade. Start: 01.08.17. 100% completed 01.11.17. —Northern Bank section 1921-1928 notes upgrade. Start: 01.08.17. 100% completed 01.11.17. —Bank of Ireland Northern Ireland 1929-1958 notes upgrade. Start: 01.08.17. 100% — completed 31.08.17. —National Bank sections on 1929-1964 currently being upgraded. Start: 01.10.17. 100% completed 14.11.17. Addition of new sections on the Private banks, generally pre-1835. Phase four will start with a basic Introductory section, onto which will be added sections with notes from various banks. The section on Private banks was started about 9 years ago, and paused shortly thereafter. Addition of new sections to the website—these sections will also undergo expansion subsequent to their introduction. 27.03.15 • Ploughman proof pictures added. 09.04.15 • Main Navigation page upgraded. 12.04.15 • Historical introduction and Old Notes introduction upgraded. 15.04.15 • Ancillary Issues upgraded. This section covers Limerick Soviet Notes and Ballykinlar Tokens. 10.05.15 • Upgraded the Contact Pages, and the About Ireland page. 22.06.15 • Euro Page updated. 01.07.15 • Northern Ireland Page updated. 28.07.15 • New pages added to the Old Notes section. This completes the first half of Phase Three for this section. 02.09.15 • google search boxes added to all primary web site pages. 19.09.15 • Upgraded the offsitelinks page. 06.11.15 • Added a page to the History section with A brief history of the Irish joint Stock banks of note issue. 26.02.16 • Main External Links page upgrade completed. The links page is now a summary of all external links used throughout the entire website, as well as a list of external resources. 22.03.16 • B Series view by date and C Series view by date sections added. 19.12.16 • Added several new images to the Bank of Ireland Old Notes section, Series F and Series G (1918–1921) completing the section by known notes. 05.08.17 • The section on Bank of Ireland notes Series H 1922-1928 has been completely revised, with the addition of a new introductory page, a gallery of every banknote by date, and lots of new images. 31.08.17 • The section on Provincial Bank of Ireland notes Series C 1918, Series D 1919, Series E 1920-1927 has been completely revised, with the addition of new introductory pages and a gallery of every banknote by date. Lots of new images have been added, with a near complete date set available to view. 31.08.17 • The Northern Ireland section on The Bank of Ireland Series I (1929-1958) First Northern Ireland Issue has been upgraded with the addition of a new introductory section, and pictures of all the note issues, including a section displaying an example of every date of issue of each denomination. 03.09.17 • The Agricultural and Commercial Bank of Ireland section has been upgraded with the addition of many new examples of the bank’s notes. Also added is a new section on Agricultural and Commercial Bank of Ireland Branches 1835-1839, with an image of a banknote from every branch of the bank, where available. 04.10.17 • The section on National Bank notes Series C 1918, and Series D 1921 has been completely revised, with the addition of new introductory pages and two galleries containing an image of every banknote by date. Lots of new images have been added, with a few of the dates still to be added. 01.11.17 • Added enhancements to the Northern Bank 1920-1927 with the addition of many new images, plus the addition of a new listing of the dates of issue for the banks in this period Northern Bank 1921-1927 Dates, and a section on Northern Bank overprints 1920-1921. 01.11.17 • Added enhancements to the Old Notes section with enhancements to the Ulster Bank 1920-1927 with the addition of new images, plus the addition of a new listing the dates of issue for the banks in this period Ulster Bank 1921-1928 Dates. Also added images of the 1929 overprints on £1 notes dated in 1927. 18.08.15 • Added a guide to grading Irish notes, suitably illustrated with some 10 Shilling notes. 25.07.16 • Added a Variations in Irish Banknotes includes a section on the Mulberry Variety, and on the 01X and 02X prefix £1 notes, dated 11.3.63. 28.04.17 • Added new introduction section to Bank of Ireland Old notes Series F and Series G (1918-1920). This is the first of the new expansion of the Old Notes section on pre-1929 all-Ireland issues of the Irish banks. Also added a section illustrating an example of every known date of One Pound notes of these two series. New content, Ploughman proof pictures added to the main website, here. These are proofs printed on card, likely sometime before ca1929. Main Navigation page upgraded. The first version 2.0.0 page on the website. Should be ok on all browsers, tablets, smartphones etc, etc. 12.04.15 • Historical introduction and Old Notes introduction upgraded. These will have a more content added to them in the second wave of upgrades. New sections which were actually prepared several years ago (and have been sitting on my HDD ever since) will also be added, likely after they have been adjusted to v2.0.0 size. 15.04.15 • Ancillary Issues upgraded. These will have a more images added to them in the second wave of upgrades which will follow completion of the main structural changes. 10.05.15 • Upgraded the Contact Pages, and skelital site map, not that there was much to do there. Also upgraded the About Ireland page, fixing the irritating bug which caused the viewer's browser to crash when the Adobe link was clicked. Don't need that link anyway! Having great fun debuging bits of left over code after stuff is moved around. Some of the pages need to be tweaked with hand-coding, it's the only way to get them to behave correctly. Phase One structural revamp is now about 50% complete. 22.06.15 • Minor upgrades site-wide to prepare for a large scale upgrade which will bring structural alterations and enhanced usability, ie fewer clicks to go from a given point to any other point. Also, many external links added to make use of resources out on the web. Home page upgraded to a new layout—still basically the same though. Back end structural links changed about a bit. Phase One structural revamp is now about 70% complete. 01.07.15 • Northern Ireland Introduction Page updated, along with Bank of Ireland and National Bank. 02.07.15 • Added a section containing some Old Irish banknotes for sale. This section was actually constructed back in 2011, but I never got round to uploading it! There is only a small number of notes on it for now, but it's a start. There are a few Ploughman Pounds, some Old Notes, and a range of Lavery Notes for sale in it. 13.07.15 • Historical introduction greatly expanded with the addition of same from Irish Banknotes (1999). The historical Timeline is the next bit to upgrade to the new format. Also, further tweaks will be made to the Historical Introduction. 22.07.15 • New version of history timeline added. Ploughman notes, A Series, B Series, C Series, War code notes introductory section. Bugs are being tracked and fixed—a few broken links, not too bad. Site-wide minor updates to many pages. Things may look a little odd in places for a while. Phase One is now nearly complete with a major upgrade of many pages in one go. Site is working smoothly, so no dropped links there! Upgrades made to all the Legal Tender Note sections, and to Consolidated notes. Errors aside, these sections are now complete. Added some new pages to the Old Notes section. Actually, the new pages were created back in 2009, but never switched on! Some of the notes sections are in need of revision and addition, which will be done after the Site Upgrade is complete. Lower level enhancements and minor adjustments to various pages will continue, but these will not be noticeable to any significant degree. Phase One completion level is now 90%, nearly done. Added a guide to grading Irish notes, suitably illustrated with some 10 shilling notes. This will be added to in the future, with more illustrations of notes. Grading is of course, a matter of opinion. Added information and bug fixes to the Ploughman notes section. I had overlooked the addition of some background information on the Munster & Leinster and Royal Banks. A brief history of all the Irish note issuing banks will be added to the history section in due course. The page is already there, just needs tidying up. Added an RTE video documentary on the Limerick Soviet. Commencing the addition of a google search facility to the main web site. Google search boxes added to all level 1 and level 2 pages. Had to adjust all the other pages to make the additions seamless. 10.09.15 • Limerick Soviet Notes section updated with the addition of expanded information on types of Limerick Soviet banknotes, and new images of the notes. 19.09.15 • Upgraded the offsitelinks page with new additions, and fixes for broken links. This was the final remaining item of Phase 1. Update on completion levels of site upgrade.